This summer Parc y Scarlets will stage MT3's Big Air Jam Freestyle Motor-X Championship. Big Air Jam is a radical competition where you will be thrilled within an inch of your life. The combined experience of sight, sound and smells in a confined space makes for a truly multi-dimensional spectacle. The Big Air Jam riders, or "Gladiators of the Ring", will perform breathtaking stunts enough to mesmerise even the biggest adrenaline junkie! On Wednesday 6th June the Big Air Jam will roll into Parc y Scarlets! Parc y Scarlets will present the UK's hottest FMX athletes in an action packed airborne battle to decide who can pull the best trick, the biggest air, the sickest whip or even the nastiest crash! Some of the finest freestyle motocross riders in Europe will be showing off their gravity defying skills featuring the UK's best freestyle riders including Chris Birch - X-fighters pilot and current British Champion; Jamie Squibb - former Big Air Jam Champion; John Pearson - first rider in the UK to pull the back flip on a motocross bike; Danny Veale, Stuart Macey, Ben Robinson and Jon Ritchie. Not content with offering you the very best of freestyle action we'll also see the retun of the Big Stunt Wars competition at half time featuring some of the best stunt action to be had on mini bikes, trails bikes, and super bikes. Participating in the Stunt Wars will be Kye Forte - former BMX World Champion, Gary Jenkins - Welsh Trials Champion and Mark Thomas - mini-bike stunt rider, all of which will be hoping to set / break World Records on the evening. The event, previously held at Margam Park and Silverstone, will make its debut at Parc y Scarlets this June and will see the top riders go head-to-head as we search for the best freestyle rider in the UK. 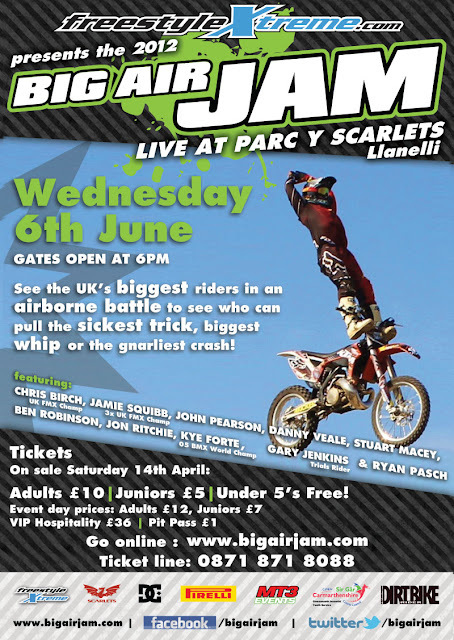 Tickets for the Big Air Jam go on sale this Saturday, 14th April, from Parc y Scarlets ticket office 0871 871 8088 .